For better or worse, this is not the case. The story is, instead, highly reminiscent of detective novels of that era, such as the Kindaichi series written by Seishi Yokomizo, but with the addition of the standard theme of all Shin Megami Tensei games: demons, devils, and dark magic. The resulting world is curiously fascinating and somewhat hard to fit in a specific genre. Considering the darker nature of the occult aspect of the game, mixed with the detective story and the fact that it is placed in the rather large capital city, a film noir feel would seem obvious, but this aesthetic is largely missing. Overall, visuals in the “normal” world are bright and warm and sometimes even comical. That is not to say that you won’t be investigating gambling rings with greasy mob bosses, but that even these characters often exist as caricatures. The dungeons, however, exist in the “dark realm”, which is sometimes an entirely new map, but oftentimes a macabre, demon-infested version of locations already visited in the normal world. Instead of the open navigation of the human world, where areas can be accessed by various streets and alleyways as in any city, certain paths are blocked in the dark realm, snaking you through the entirety of the city locale until you confront the boss at the end. This parallel light/dark world is nothing new to video games, but where it may lack in innovation, their handling of the two worlds is well executed. Combat, on the other hand, shows off Atlus’ skill at combining tried and true formulas in creative new ways. The only human you control is Raidou Kuzunoha, a student, detective and first-class devil summoner, who is entrusted to protect the capital city from evil. In essence, the rest of your party is composed of the summoned demons. So how do you acquire new demons? By negotiating with them on the battlefield, of course! Amid the normal battle commands, Raidou has the option to negotiate, in which you may cease battle and attempt talking to one of the enemy demons. Each type of demon will have a different personality, ranging from cocky teenager to humble old man all the way to raving lunatic. In each case, you need to feel out the appropriate responses so they will work with you. For example, bragging about your skills may impress one demon but anger another. During negotiation, the two demons you currently have out can help by flirting, debating, flattering and so forth, all depending on their special negotiation skill. Each demon your recruit will build up loyalty the more you use it, which helps you improve your skills as a summoner and will inspire them to give you presents, used in improving your sword. by repeating a move of your choosing unless commanded otherwise. In addition to the standard RPG tendency for elemental strengths and weaknesses, Devil Summoner 2 also adds frailness. While the damage increase is comparable to a normal weakness, when demons are hit with attacks they are frail to, they are also temporarily stunned. By physically attacking stunned demons, MAG is recovered. MAG is essentially MP, the points expended when using special attacks or magic. This extreme emphasis on utilizing the weak point of your enemy is highly characteristic of Shin Megami Tensei games and adds an element of strategy. Frailty can quickly swing the tides of battle and players would be foolish not to quickly master the strategy. All of this makes a combat system that is fun and engaging and often left me poised at the edge of my seat. Of course, demons have uses outside of battle too. They possess one or two skills to use in investigations, such as mindreading, disguise and scouting. This means that a well-rounded party is not simply one with a good battle plan, but one with some useful negotiation and investigation skills as well. 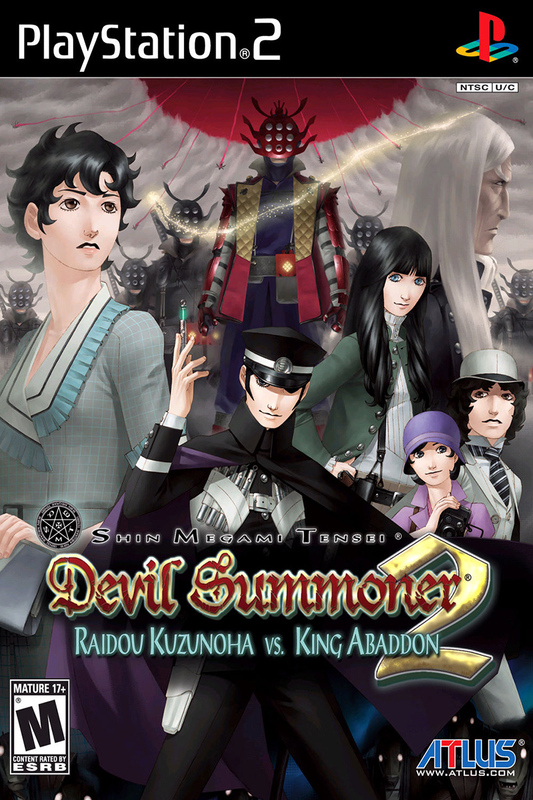 In spite of the rather small-scale release of Shin Megami Tensei: Devil Summoner 2: Raidou Kuzunoha vs. King Abaddon, the game is certainly worth seeking out and likely soon before its rarity causes prices to skyrocket, as happened with its predecessor. The game provides Shin Megami Tensei‘s usual blend of humor and macabre in a very 1920s and 30s world of detectives, mad scientists and all other sorts of pulp fictiony goodness. For fans of good gameplay, witty writing and a touch of the occult, it’s a hard game to pass up. This story first appeared in Gatehouse Gazette #8 (September 2009), p. 17-18, with the headline “Demons in 1930s Japan; Devil Summoner 2”.